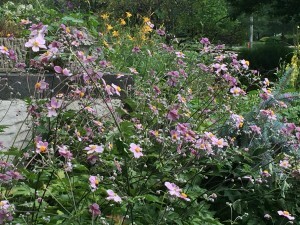 The queen of the fall shade garden is Anemone x hybrida (Hybrid Anemone or Japanese Anemone, zone 3) and its related species. There is a great deal of confu­sion about which ones are which, but for our purposes, it’s irrelevant. Their habits are very similar, and they feature large, divided or lobed foliage. All grow two and a half to three and a half feet tall, which makes them an excellent background for whatever is planted in front of them. Blooms appear in late August to early September as singles or doubles, and in shades of white and pink, according to the specific cultivar. 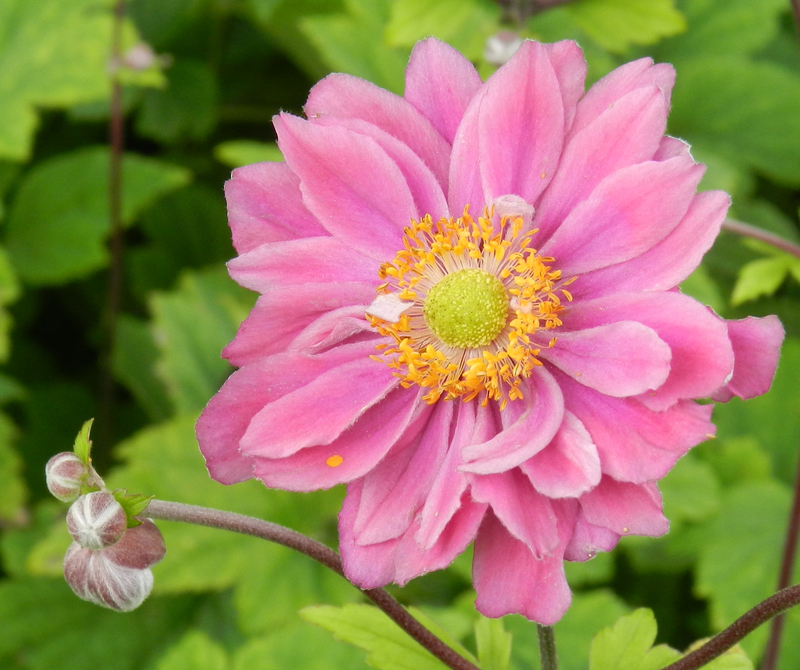 A.hupehen­sis ‘September Charm(September Charm Anemone) is a single that displays rosy-pink blossoms that are darker on the outside and silvery-pink on the inside, giving the impression of a bicolor. 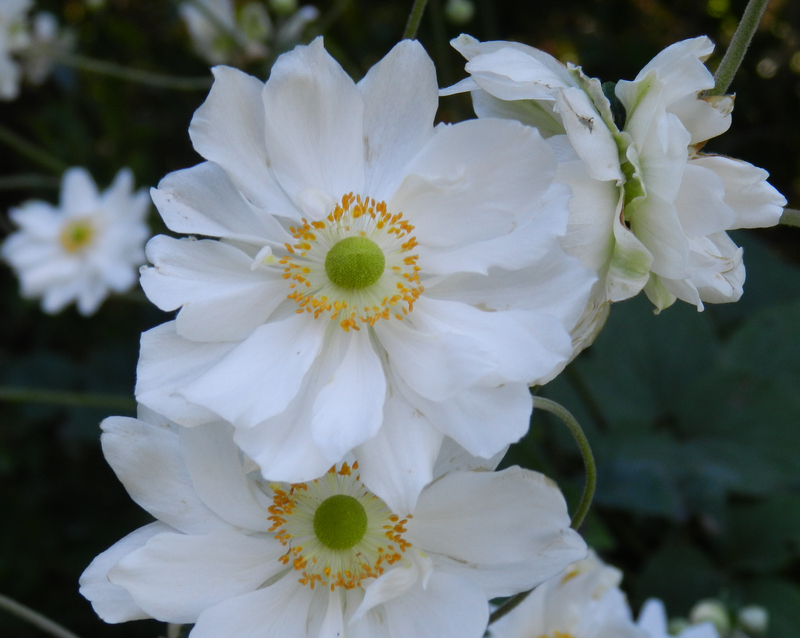 A.hupehen­sis ‘Prince Henry’ and Anemone x hybrida ‘Pamina’ are virtually indistinguishable. 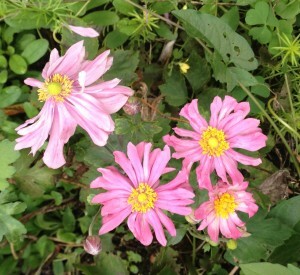 Both are deep pink doubles that grow two and a half feet high. If you want pale pink, try the double Anemone x hybrida ‘Party Dress’ or the single Anemone x hybrida ‘Queen Charlotte’. Both will grow three feet tall. White cultivars to try are the single ‘Honorine Jobert’ (two to three feet) and the double ‘Whirlwind’ (three to four feet). The cultivars in the Pretty Lady Series only grow twelve to sixteen inches tall and tend not to be as rambunctious as their taller cousins. Try ‘Emily’ for double light pink flowers, ‘Julia’ for double vivid pink flowers, and ‘Diana’ for single lavender pink flowers. These anemones are very adaptable. I’ve grown them in full sun, part sun, part shade and a lot of shade. As long as they get at least three hours of direct sun or filtered light all day, they will thrive. They are not picky about soil either. They do need some moisture on a regular basis; otherwise, the leaves shrivel but do not plant them in water-logged soils. 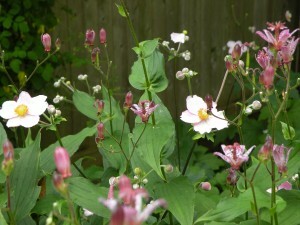 Give Japanese anemones plenty of space; they are vigorous but easy to dig if they spread further than you would like. In my front sun garden, I’ve used ‘September Charm’ with Asclepias incarnata ‘Cinderella’ which blooms a month before. In my back sun garden, ‘September Charm’ serves as a background for Aster oblongifolius ‘October Skies’ and Rudbeckia ‘Pot of Gold’. In the part shade garden, it is neighbor to Tricyrtis hirta and ferns. 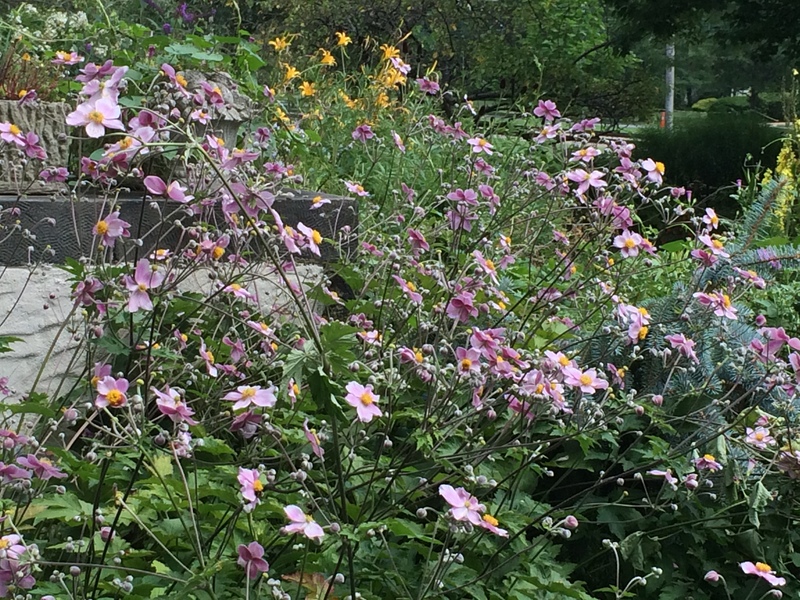 Happily, this long blooming, fall perennial is also deer resistant so I’m sure you can find a place in your landscape for it.